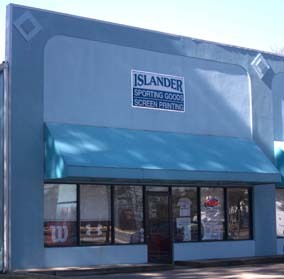 Welcome to Islander Team Sports, a great choice for all individual and team sporting goods in Hampton Roads. Come see our new location just outside Poquoson, in Hampton, across from NASA on Wythe Creek Road. We have provided high quality uniforms and equipment to the area`s youth leagues, high schools, colleges, military and other organizations for 30 years. "Our goal is to provide complete one stop service to all our customers." We proudly market items from companies such as Nike, Under Armour, and Wilson, Lousiville Slugger, Schutt... just to name a few. We specialize in varsity jackets for all Hampton Roads schools. We can customize varsity jackets for any school. See our DEPARTMENTS page for material, color and style samples. Call us or give us your order online. Need specialty clothing items with personalized screen printing or embroidery? We have the latest in design and application technology to create just what you need. From Tee shirts and hoodies to jackets and hats for your business or sports organization. We have access to all major brands of apparel and accessories to ensure you get just what you are looking for.